Autumn's here – and September's jam packed with some superb events and festivals that span everything from food to boats to Juliet. John Bensalhia reports. September. In a sense, it brings a wistful air as it heralds the close of the Summer season (and for this particular scribe, it's the month that means he creaks even further into his 40s). But in Italy, September doesn't mean wistful – the country is too busy celebrating with a slew of magnificent festivals encompassing tradition, food, a Shakespeare heroine and much more! So, here's to September – bring it on! Do you have a thing for pizza? We do too and this week 50 of Naples’ most renowned pizzerias will set up shop on the popular promenade area. This means a week of “pizza performances”, workshops, a world championship, music and shows will all contribute to make this an entertaining – and tasty – event revolving around pizza. More details here. The 72nd festival celebrating all things cinematic is due to take place between 2nd and 12th September. The festival boasts a strong line-up with some great competition entrants from Italy and around the world. 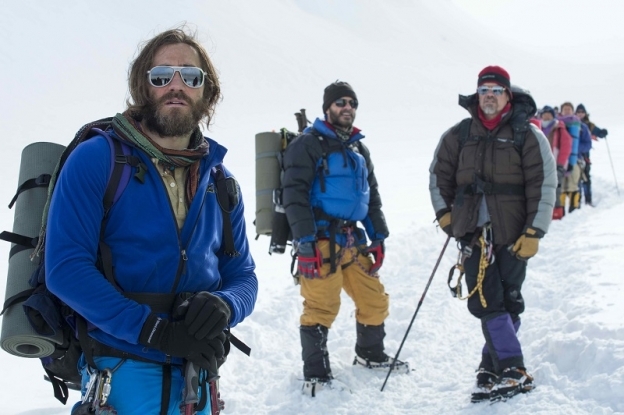 In addition, there will be special screenings of films such as Everest and Mr Six – and also specially restored versions of some classic competition movies. For more details, see the article on what to expect from this year's bumper line-up! In 1669, a terrible disaster occurred. As an eruption from Mt Etna caused chaos and destruction in the area of Misterbianco, no one could have predicted that a miracle was about to take place. Despite the ferocity of the lava eruption, amazingly, the sanctuary bearing the name of the Madonna remained intact. It's this miracle that is celebrated in Misterbianco during the first weekend of September which is called La Festa della Madonna degli Ammalati (the Festival of the Madonna of the Sick). Among the lava was a 51 kg bell which was rescued and to this day, it is ferried in procession. Also taken through the streets is a picture of the Madonna and Jesus. A notable tradition is for the assembled people to join together, link arms and sing and dance their praises of the Madonna. Regata Storica is the main attraction of the annual Voga alla Veneta rowing event. A series of races wows the crowds – these are designed for various sectors in accordance with different races for youngsters, female rowers and boat types. Heralding the event is the traditional parade that delights and entertains in colourful, flamboyant style. A procession of 16th century style boats makes its way along the Grand Canal – even the gondoliers are dressed accordingly in period costume! Another notable aspect of Regata Storica is the famous Campioni su Gondolini. 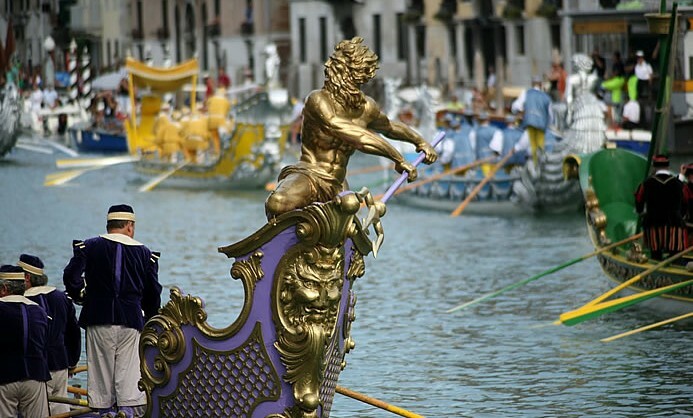 The end game of this race is for the small, sporting gondolas to race to the finish – a spectacular floating stage in front of Ca Foscari Palace known as the 'Machina'. Parting may be such sweet sorrow – but the heroine from Romeo And Juliet is greeted again with gusto every year on her birthday in Verona. One of the most striking customs connected with Juliet is the Wall of Letters in Verona. The Wall attracts letters from people all over the world and is an extension of the old tradition of leaving notes on the tomb of Juliet. A club was formed to reply to the many letters sent. Verona says Happy Birthday with a great big party. Among the goodies on offer are musicians, period costumes, street artists, dancers and of course, ready food and drink (where would a party be without these?)! Special parades are also held and pay tribute to the Courts of the Montagues and the Capulets. Lighting the way this month is Luminaria Di Santa Croce, a memorable procession that takes place in Lucca in Tuscany. One of the key aspects of this event is the display of a wooden sculpture of Christ, Il Volto Santo, which is taken from the Basilica of San Frediano, through the medieval streets, to the Duomo. To add to this spectacle, the streets are illuminated with candles that light the doors and windows of the buildings – in addition, candles are carried by those taking part in the procession. It's an awe-inspiring sight and one that's not to be missed. Also worth a look is the market stalls of Settembre Lucchese. These include all sorts of goodies to buy, including clothes, speciality foods, snacks and drinks. Taking to the local seas will be a boat bearing a statue of the Golden Madonna. The mini voyage is set to take place in Patti, Messina during the second weekend of September. The traditional festival involves a beautiful boat procession that is led by the vessel bearing the Golden Madonna. The leading boat is lit up and is a wonderful sight to behold. Adding a touch of celebratory finesse, plenty of additional treats are laid on for visitors, including music, dancing, and of course, food and wine – to make this particular celebration ship shape! Will the miracle happen this year on the Feast Day of San Gennaro? It's a question that is on everyone's minds in attendance at this annual tribute to the Patron Saint of Naples and the Bishop of Benevento. San Gennaro was a firm believer in the Christian faith, but tragically, this belief led to his untimely death in 305 AD when he was persecuted and ultimately executed. The annual Feast Day witnesses crowds paying homage to San Gennaro. The aforementioned miracle takes place at Naples Cathedral and Piazza del Duomo. Vials of blood are taken to the altar of the cathedral and if the miracle happens, then that blood becomes liquid as a sign that San Gennaro has blessed Naples. Nobody likes missing out on the prize of first place. Right from the days of narrowly being pipped at school in the egg and spoon race, it may be great to compete, but it's always preferable to win. So for those who didn't win at the annual Historical Regatta at Venice, the Burano Regatta is the ideal opportunity to try again. The contest is open to both male and female competitors, who will again have their eyes on the prize in this highly enjoyable boat race. It's a great spectacle for the crowds who will be able to witness the event from the shore of the island. Spud you like? You bet, especially in this seventh edition of the Bologna festival. Highly regarded in its field as one of the finest, the Bologna potato is of supreme quality and one of Bologna's greatest players in its economy. So what better way to celebrate this marvel of the soil than a week-long festival? The idea is to promote the potato as one of the tastiest and most adaptable vegetables that you can enjoy in any shape, form or size. Jacket potatoes, mash, and of course, good old-fashioned chips – it's a safe bet you'll be enjoying the potato in some form or other. And with a Bologna potato in the mix, the taste will be at its finest. The festival will include a selection of special events and furthermore, over 300 participating restaurants will promote the Bologna potato as the star of the show in their menus for this week! So who was Padre Pio, the man celebrated in San Giovanni Rotondo in the month of September? Padre Pio is also known as Pio of Pietrelcina. This friar arrived at the Capuchin Monastery in San Giovanni Rotondo in 1916, which is where he remained until his passing on 23rd September 1968 – the date of the annual commemoration. As well as being known for his caring of the sick, Padre Pio is best known as being the man who experienced the Stigmata in the year 1918. He endued both pain and bleeding in the same places suffered by Jesus at the time of the Crucifixion (including his hands, where the nails were hammered into Jesus' own hands). But it was the reports of the smell of the blood that added weight to the witnessing of a miracle. Emanating from these wounds was a smell of perfume or flowers, which was the same as the odour of sanctity told in the tales of the lives of saints. In 1918, World War One ended. Some believed that Padre Pio's experience was a sign of hope and good fortune for the future. Padre Pio posthumously achieved sainthood in 2002 and will again be honoured around the date of 23rd September with prayers, processions and reflection. St Michael the Archangel, the faithful servant of God, will again be celebrated throughout Italy on the 29th September. It's one of the oldest festivals in Italy's calendar – and wherever you are, it's also one of the most impressive. St Michael has been prayed to in times of crisis to act as protector – so with that in mind, it's no surprise that he is also the patron saint of paratroopers, police and sickness, amongst other things. One of the country's best known celebrations takes place at the Sanctuary of the Archangel Michael on the Gargano Promontory of Puglia. Among the many events celebrating St Michael will be the Ischia procession that carries the statue of the saint. Musicians and fireworks add extra pizazz to the event. Fireworks will also be released in Alghero which also doffs its hat in farewell to the Summer season with celebrations that also include music, fun and games.